I took Communion and participated in the imposition of ashes at First Congregational; Communion and witnessed a baptism at CCCEV; participated in an elder/deacon ordination at Historic First; caught the last of the Mass at La Placita. First Congregational is a self-described liberal church. Seldom have I visited a church which is more liberal than I. Here, people do not say “Lord” except when singing in Latin; there has been some trouble decades ago about the divinity of Jesus not preached from the pulpit. “Blessed be”, an imperative without a noun, seemed to be enough for this congregation. 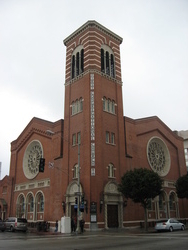 There was a banner in the front of the sanctuary with a quote by Martin Luther King Junior: “The principal objective of all nations must be the total abolition of war.” I was generally pleased, but I did wonder what they have to say ultimately, when all has been stripped away like this? On the other end of the “spectrum” is CCCEV. It felt like a theatre with no natural light, but dry-ice smoke-throwers and air-conditioning. The sermon – or shall I call it the one-man theatrical monologue? – delivered from a swivel-chair, was full of popular-culture references (even a sitcom clip on the projection screen! 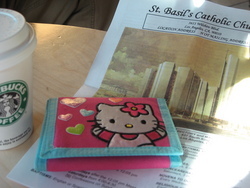 ), complete with fill-in-the-blank sermon sheets. The preacher dissed Kanye West, ignoring that he is one of the most influential Christian artist these days, who is biasedly-committed to the Poor, and can get his Jesus Walks played on the radio. Who are you to diss Kanye, man? The whole thing fit snugly in a critical analysis of the Spectacle in the Situationist school. The bookstore had about a hundred copies of the Bible, but only in three versions: dominantly NIV, NLT, and The Message. 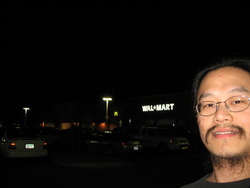 Suitably, we went to Wal-Mart later that evening. I note curiously that neither of these two churches actually let the Holy Communion work itself out well enough, sad to say. Oh man, you should have swung by and said hi… I work at City Hall in downtown L.A.
Good points on the strangeness left behind when many things are stripped away. Perhaps this article featuring another old Caltech scholar can help elucidate? Great to see that Dann is (on the evidence of his Flickr stream) doing OK.
>Who are you to diss Kanye, man? That’s right. Did he have any specific West-related concerns? > I note curiously that neither of these two churches actually let the Holy Communion work itself out well enough, sad to say. I’m not sure what you mean by this. Can you elaborate? The minister Cal Jernigan’s concerns were mainly about Kanye’s hubris. He quoted Kanye saying that the MTV Music Awards will lose credibility if he did not get it, and that if the Bible were to be written today he would be in it. First Congregational kept saying that it is non-credal etc. Interestingly, the only words I could find after the phrase “We believe” were these highly-qualified ones (by the minister Jerry Stinson in a leaflet Our Liberal Theology): “We believe death brings absolute cessation of mind and body, but acknowledging mystery and the limits of human knowledge, we also affirm that that does not rule out possibilities of something beyond death, ranging from the immortality of the soul to reincarnation.” Personally, I prefer “I believe in […] the resurrection of the body and the life everlasting”, or the Nicene formulation of “we look for the resurrection of the dead, and the life of the world to come”. Let me say that at both First Congregational and East Valley, the Words of Institution were either not said, went past so fast that there was neither the sense of occasion nor the time for them to be noticed, let alone to sink in. If you are arguing the point that proper verbiage leading up to the act of communion (such as describing it as an institution) was not used, then maybe the issue isn’t so much with the churches as it is with an inability to detach yourself from a mindset of traditionalism. Whether it is referenced as the institution of holy communion or just simply as communion, the truth is that the elements and significance to Christian remain the same. As far as letting the act of communion soak in, it isn’t up to the church to get your heart prepared for communion, it is up to you to walk in to that service with a heart that is prepared to take communion. Every church has their pros and cons, but it shouldn’t matter how the message is being delivered, be it from behind a pulpit or sitting in a swiveling chair preaching “monologue” style. All that matter is that people are listening and receiving the message. CCCEV alone is pushing 1,000 baptisms over the last year. I would say that they have to be doing something right. On the Kanye West front, I personally believe that he is full of himself and if his lyrics DO point to God, for many, that is overshadowed by his tantrums, ego and saviour-esc persona. Maybe it shouldn’t, but we’re human beings, so the “how” is often as important as the “what”–sometimes moreso. I guess that I am not understanding your argument. If I come to Christ because of a message preached from a swivel chair, does that make me any less of a Christian, or for that matter, any less knowledgeable of Christianity? Whether someone finds Christ in the most traditional of services or the most contemporary of services, what really matters is that they find Christ. After that, it’s up to us to get plugged into daily devotions, prayer and small groups so that we can better understand who exactly Christ is and how we can better follow Him. It isn’t the church’s job to do that, yes they play a part, but your spiritual development mainly relies on you. I guess that I also disagree with your theory of the environment. Just because a church has a theatrical feel to it, that doesn’t mean that the messages are watered down. The truth is, many people aren’t going to churches because they feel out of place. Lighting, sound, hazer’s, etc. bring the feel of non traditionalism into the church and in the grand scheme, make the person who feels like they don’t belong, feel more comfortable. Lighting, sound, hazerâ€™s, etc. bring the feel of non traditionalism into the church and in the grand scheme, make the person who feels like they donâ€™t belong, feel more comfortable. For some, yes, but then there are those of us who feel more at home with more traditional elements. Exactly, I was never saying that traditional is not impactful or ineffective. My point was that maybe we shouldn’t get so caught up in non traditional verbiage, preaching style, presentation, etc. For you, you may find that the most classical of services in a classical environment is what suits you. For me, it may be a contemporary service with theatrical elements. The only thing that really matters is that the Truth is being preached. As Christians, we need to take what we know about Christ, His love, His sacrifice, His forgiveness and His Grace and share it with the world. If we did a better job at representing this Truth to the world, I believe that the world would be a different place. Just read your posts. Next time you are in Phoenix you might want to swing by Scottsdale Congregational UCC near Camelback and Granite Reef. Their 11:00 am service is worth the effort.